"The Sama represents a mystical journey of man's spiritual ascent through mind and love to perfection. Turning towards the truth, the follower grows through love, deserts his ego, finds the truth and arrives at perfection. He then returns from this spiritual journey as a man who has reached maturity and a greater perfection, so as to love and to be of service to the whole of creation. " The subject of this piece is a dervish at the beginning of a Sama, or Sufi ceremony where the dervish seeks to remember and connect with God through active meditation. At the start of the ceremony the dervish begins with their hands crossed over their heart, spinning slowly, then raising their arms. 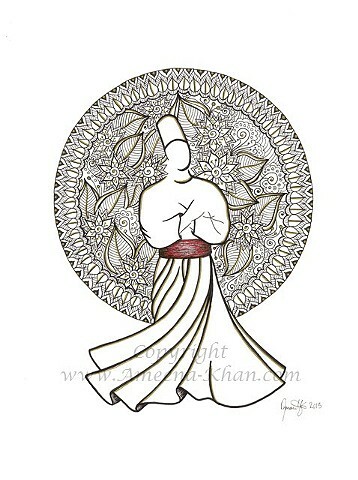 While spinning, the dervish's right hand is raised to receive God's beneficence, while their left hand is directed towards Earth to bring the beneficence to the world. The background of the piece is decorated with detailed floral henna / mehndi patterns created in black ink with golden highlights.